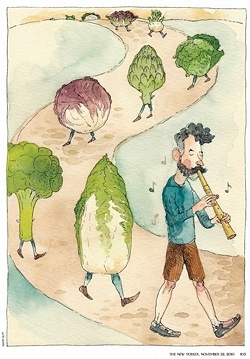 A self-avowed “fermentation fetishist,” Katz travels around the country giving lectures and demonstrations, spreading the gospel of sauerkraut, dill pickles, and all foods transformed and ennobled by bacteria. His two books—“Wild Fermentation” and “The Revolution Will Not Be Microwaved”—have become manifestos and how-to manuals for a generation of underground food activists, and he’s at work on a third, definitive volume. When I met him, Katz was on his way to the Green Path, a gathering of herbalists, foragers, raw-milk drinkers, and roadkill eaters in the foothills of the Smoky Mountains. I've uploaded the whole document as a PDF (13 MB) file here. Just click to download.